The Forecaddie with all the details on 2017 Masters champion Sergio Garcia's donation-choice to the legendary Augusta National collection. It's also a friendly reminder that a hole extended by Augusta National is now being approached with 8-irons, even with the slower-rolling fairways. Tiger Warren Wind's 1500 word blog post yielded the predictable glee over news of putting contests at the house with Rickie and Justin, but there were a few more intriguing references for the seasoned Woods observer. Given his recent book and the extensive chapter on technology taking away much of the Augusta National he knew, this Woods line regarding new Chairman Fred Ridley suggests he's looking for changes. No more mowing fairways toward tees, maybe? 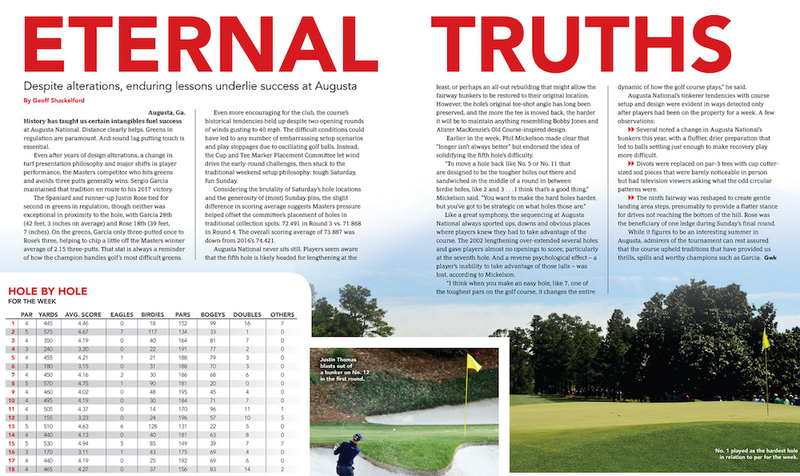 A firmer, tighter and faster Augusta National would show how ridiculously dated the course has become despite governing body claims of a distance flatlining over the last decade. Either way, a throwaway line from Woods is a reminder that with the change in Chairmanships, something of note is around the corner. The Augusta Chronicle's Sandy Hodson reports on Augusta National's court victory over Green Jacket Auctions related to the current sale of the world famous sports coat. Augusta National filed suit Aug. 11 in federal court in Augusta seeking an immediate halt of an auction begun Aug. 2 by the Green Jacket Auction Inc. of Tampa, Fla. The auction, set to close Saturday, lists three green jackets, silverware and a belt buckle all advertised as authenticated Augusta National and Masters Tournament memorabilia. On behalf of the Augusta National, Christopher Cosper argued in favor of a temporary restraining order to keep the auction company from selling what the club contends is stolen property or fakes which are prohibited by the club’s trademark. The club also contends that a document the auction company has that it says is a 2005 inventory of the club’s property also had to have been stolen from the club. The jackets are still listed as of now. Sky Sports lost the PGA Championship on short notice and appears headed toward also losing the Masters, and as James Corrigan explains in this Telegraph exclusive, BT is now in talks to carry the Masters. Not only is it an issue for Sky, but as Corrigan explains, could have ramifications for the European Tour and USGA. BT sees this as the ideal avenue to enter golf, but there are nervous faces not only at Sky but also the European Tour. Without Sky’s backing the Tour would not operate its present guise, if at all, and the last thing the powers that be at Wentworth HQ would want is for Murdoch Towers to become disillusioned with the sport and walk away. Yet any sense of ingratitude on Sky’s behalf would be totally understandable, especially with rumours circulating that the USGA, which runs the US Open, is ready to look elsewhere in the quest for bigger viewing figures when its deal runs out in 2018. Sky Sports And The Masters: Are Golf's Governing Bodies About To Cut The Cable Cord? In the week Sky Sports has introduced a dedicated golf channel here in the UK for its extensive golf offerings, we learned they have lost the PGA Championship rights held since 1992. Now Ben Rumsby reports exclusively for The Telegraph that Sky did not get is Masters contract renewed, while weekend and highlight rightsholder BBC did following the Masters. This latest news, while not immediately affecting American viewers, suggest we are on the verge of seeing a major shake up in how golf tournaments are seen. It's hard to see where The Masters goes except either to BBC for four days or to a streaming/app only version. Or, dare I say, testing out a pay-per-view model. Could this also be the case for the PGA of America in the long term? Perhaps, though it's still a head-scratcher to not have their UK broadcast rights settled a month out from their championship. We've seen signs in recent years that golf's leaders believe they will have to create very different ways to reach audiences going forward, but given that golf fans tend to be five years behind on most trends, might some of their sponsors think they're getting ahead? Or is this the perfect time to test out new models on a relatively small but sophisticated market? Is that enough rhetorical questions for a Friday? Clifford Roberts did not suffer fools gladly, or mistakes, or anything involving imperfection. 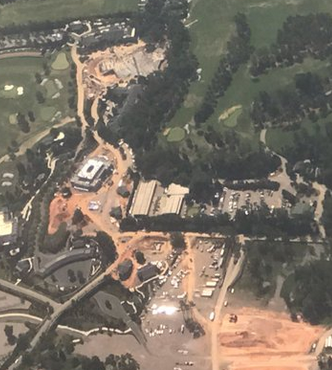 To no one's surprise--including those reporting the sight of huge crane's helping to erect new structures at Augusta National, the club is finishing off the final upgrades to the Masters patron entrance area. Thanks to @menworking for catching this tweeted aerial from Justin Wheelon. More intriguing is work on the second hole, perhaps drainage related, and the lack of work taking place at the par-4 fifth. Earlier this year, Chairman Billy Payne all but predicted changes were coming to that hole. Sergio Garcia is taking the Green Jacket all over the world and it's hard to imagine a better scene than this one before a Real Madrid-Barcelona match. Besides appearing to have benefitted from some work by his tailor, Garcia's jacket display features a strong lefthanded kick. But as Golfweek's Kevin Casey notes, this is not unusual given Garcia's lefthanded golfing and left-footed shoe kick (yes, it's aged well!). SI: "Behind the scenes with CBS on Sergio Garcia's winning putt"
SI's Richard Deitsch gives us a behind the scenes look at how CBS captured Sergio Garcia's winning moment at the 2017 Masters. It's easy to forget the role television production plays when a moment like Sergio's comes off so seamlessly, particularly given the difficulty of covering golf courses. Add in Augusta National's 18th hole limitations--no crane, blimps, helpful topography--and covering the moment becomes a huge challenge. Oddly, the best shot may have been the view from down the fairway with Sergio and putting surface just a blip amidst the patrons (screen captured). Milton said during the live coverage of Garcia’s winning putt, he went through a familiar sequence for a golf director: First, you go wide, then you go tight. The goal is to capture every reaction you can from the scene. Milton said the CBS production compound at the Masters (which sits next to the Par-3 course) had roughly 12 staffers in the main control room working the final holes. There was also an adjacent room with 12 people working on graphics. As the final shot was made, Barrow and Rikhoff were filtering the best replays. Rikhoff watches all the isolation shots directed by Milton and notes what will work for replay; Barrow decides in what order the replays will sequence to create narrative. The last minute or so of this CBS highlight reel captures the incredible coverage work described in Deitsch's story. Also, seeing these clips again makes you realize (A) how much of a slope the 16th hole cup is on (B) how long Rose's putt was on 17 for par, (C) how close Rose's in-regulation putt on 18 was to going in, and (D) how great Sergio's final putt was both in execution and in ending the Masters on a high note. "García’s Masters triumph reveals the secret of sportsmanship"
The Guardian's Andrew Anthony nails down what was so satisfying about Sergio Garcia's Masters playoff win over Justin Rose. He could have started his familiar antics at that stage, snapping at his caddie, grumbling at the crowd, chucking clubs, remonstrating with the heavens, demonstrating that he was, as Padraig Harrington has said, “a very sore loser”. But instead he accepted the possibility of defeat, made his peace with it, and realised life would go happily on if his Ryder Cup mate Rose emerged the winner. Suddenly the lavishly talented man who wilted against the iron character of Tiger Woods, and twice cracked as the grittier Harrington snatched major victories from his grasp, looked comfortable with – even happy for – his opponent. And finally García won. Gamesmanship stems from a desire to avoid defeat at any cost. The secret of sportsmanship is that learning how to lose can also teach you how to win. "How did things ever get so far?" "This Lexi business is going to destroy us for years go come." I'm paraphrasing of course, but it's fun to imagine the professional tours--which let their players play slow, mark their golf balls constantly (unless it's a backboard for a playing partners)--whining about the Rules of Golf not having addressed issues related to HD and DVR's. But as Jaime Diaz reported in Golf World, the Corleonie's, Barzini's and Tattaglia's of golf got together to bark at each other about Lexi Thompson's penalty at the ANA Inspiration. Something tells me that did not give Commissioner Whan a warm, fuzzy feeling. And this is why we still have cause for concern, just as we did in the days after the Lexi situation. Golf’s leaders hope that the public will come to regard the rules as better reflections of common sense and fairness. But ultimately, it’s unavoidable that they will be applied on a case-by-case basis. In Thompson’s case, even under a new standard of intent and reasonable judgment, it’s not clear that she would have not been penalized. As the video shows, Thompson missed replacing on the correct spot by about half a ball. Half a ball doesn’t seem like a lot, but especially on a short putt, it constitutes a pretty bad mark. It's hard to argue with Chairman Billy Payne's era as Masters Chairman. Sure, he follows the bumbling Hootie Johnson and just about any sign of progress or forward thinking would have made for a successful tenure after those turbulent years. But the stability Payne brought to tournament business, coupled with the improvements to the property under his watch, makes it very hard to see anyone else doing the job (particularly when the not-gregarious Fred Ridley's name is mentioned as a likely successor). Can you imagine anyone else spearheading the Drive, Chip and Putt or resisting the urge to spend some of that Berckman's Place money on more course changes? This was the point of my May Golfweek piece on Payne's tenure and the other many progressive moves that have upheld the Roberts/Jones desire to constantly advance The Masters as a sporting event. However, there is Payne's odd issue with cell phones, which doesn't make much sense when juxtaposed against other digital initiatives. The summer of 2017 figures to be an interesting one for Payne since, as I wrote in this golf course-focused piece for Golfweek, the 5th hole is likely to see changes. The extent of the changes could range from a mere lengthening to a total land rearrangement to expand the course border once constrained by Berckman's Road. Given the original hole's design concept, the changes made since, the difficult land forms at No. 5, and the lack of respect for strategic design by consulting architect Tom Fazio, I don't have high hopes for an upholding of the Jones/MacKenzie vision. That said, Payne stemmed the Hootie Johnson era hemorraging, and that was a huge victory for those hoping to see some preservation of what remains from the original design vision. The "second cut" of rough still strips the place of elegance that you get with wall-to-wall tight grass (not to mention slowing balls from the pine straw), and still rears its head on odd places. The leafy, 3/8 inch-cut fairways do slow down roll but have made a links-inspired course almost entirely an aerial design. With his first major golf course change potentially in the offing this year, we'll get to see another sign of Payne's chairmanship. One that most Masters watchers hopes does not end any time soon. There is still much to consider from this year's Masters broadcasts, but before we consider what it all means for the future of golf on TV, a few stories related to the always-scrutinized telecast. The annual Classic Sports TV compilation of shots shows that since tracking has taken place (2014), the 2017 Masters featured the most shots shown per minute (1.41). Kevin Chappell, 7th, was the highest finishing golfer not to be seen. As for the ratings decreases, Joel Beall at GolfDigest.com talked to former CBS Sports president Neal Pilson who thinks the lovely weather in much of the northeast cut into the number of folks watching. "Good weather is a killer in swing months. In the fall, people are sneaking in one last trip to the park, and in the spring, it's more pronounced, going outside for the first time," Pilson says. "It was a gorgeous day in the Northeast, where 20 percent of America's households are located. I had to struggle to stay inside myself." Interestingly, Pilson did not think the number of people streaming cut into the main number. I think that may be a tough sell for those of us who all know people who...streamed instead of watching on a conventional television. I know that daylight issues discourage the Lords of Augusta from ever considering Amen Corner from being used for playoffs. Deciding the Masters in a sudden death playoff continues to not sit well with me and Justin Rose's errant tee shot Sunday reminded why it's such cruel way to decide history. The other majors and Players use aggregate playoffs and the golf world is a better place for it. Shoot, even a two-hole aggregate of the 10th and 18th would be better than sudden death and faster given the 10th tee's location. You'd get play on two demanding holes requiring very different shot shapes. Matt Adams and I discussed with Lisa Cornwell today while John Feinstein enjoyed a post-Masters break. Great to see golf on the Sports Illustrated cover accompanied by Alan Shipnuck's cover story and portrayed so beautifully by Fred Vuich's image. Golfweek's April issue went with Andrew Redington's shot for Getty Images. Global Golf Post used Harry How's shot for Getty Images.